So you’re contemplating the jump from BlackBerry to iPhone and wondering what you should expect. Having done the same thing a few months ago, I wanted to share my experience and help you save some time getting your iPhone set up to suit your needs. You’ve already heard how great the iPhone is, so instead of preaching more of the same, I thought this blog would be more helpful if I highlighted a few of the challenges with making the switch or, a few things you may want to consider before making the switch. The email experience on a BlackBerry is superior to the iPhone. Yes, I said it and despite having switched months ago, I still reach for my phone occasionally when I hear the unmistakable BlackBerry email chime. The whole premise of checking email doesn’t exist on a BlackBerry and RIM’s push email functionality means that you never have to check your email. On the iPhone you can have your email accounts set up to check periodically – (every 15 minutes, 30 minutes, or hour) -, but it just isn’t the same thing. So, if email is a critical part of your professional life or the BlackBerry has been a part of your cell phone DNA for years, this seemingly simple difference will take some getting use to. On the other hand, cell phones have evolved way beyond simple email messaging devices and the other many advantages of the iPhone outweigh this drawback. BlackBerry has long touted the advantages of its QWERTY keyboards and five years ago that was all we knew. While yesterday’s power user may still be use to the keyboard for sending emails, BBM messages or whatever, the physical keyboard comes at the expense of a bigger screen, unless you happen to be a BB 9800 or BB 9900 user. As a former BlackBerry Torch user myself, I never used my slider keyboard and the virtual keyboard on the Torch can be frustrating at times. A simple email can be a miserable experience just based on where the global language button is positioned with the inadvertent messages in Chinese, Japanese or some other language, and the auto correction/suggestion is lacking at times. Apple on the other hand has perfected the virtual keyboard in my opinion. The keyboard is sensitive and responsive and the auto correction/suggestion is simply amazing, so there is no need to concentrate on where you click on the screen as long as you are in the general area, you somehow get it right. All in all, the iPhone’s virtual keyboard is close to perfection and simply the best virtual keyboard of all the smart phones in market today. Install Thunderbird (a free email client) on your PC and import your CSV file into Thunderbird. Now you can import the LDIF file of your contacts into Address Book on your Mac PC. This process can be a little quirky once importing to Address Book and may require some additional time finessing the fields of information imported for each contact. With a little patience and good luck, at the end of this exercise you will have your full list of contacts on the iPhone and any updates that you do should be done within Address Book as opposed to MS Outlook, or you’ll have to repeat the entire process. Of course, if you didn’t have your contacts in MS Outlook you can just enter them on your iPhone directly if you have time to burn, or if you happen to be a Google App user, you can install Google Sync and sync your outlook contacts to Google’s cloud and from there to your iPhone. On the iPhone 4S it’s easy to set up multiple mailboxes for your email, however, the main challenge you will discover is not being able to have multiple signatures for each of the those mailboxes. In other words, you can only have one signature for all of your outgoing mailboxes. If your in tune with life as an iPhone user then your first thought will be, “there must be an app for that?” A quick search of the Appstore for “multiple mail signatures” yields a few results with very average ratings, but a new addition called MailSig by Ziximo appears to offer some promise. Also, here are 5 iPhone Apps that you didn’t know you want, but can’t live without. The iPhone is a lifestyle. Let me repeat that, the iPhone is a lifestyle. It’s your iPod for your music, it’s your camera that takes better pictures than the BlackBerry, it’s your window into a world of apps that can almost do anything you dream of and the overall user experience is superior to the BlackBerry as a result of all of these things plus plenty more. 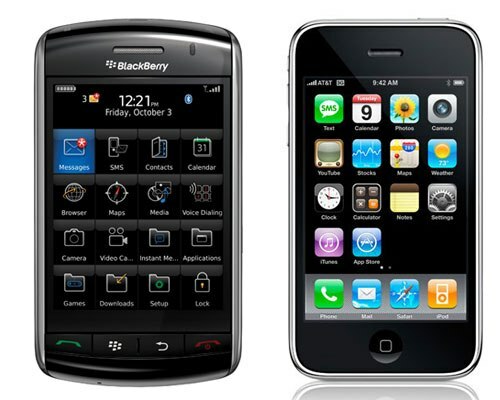 So, until RIM get’s their act together and really ups the ante with some new devices, making the switch to the iPhone is an easy decision. If you’re in market for a new iPhone, take advantage of myCELLmyTERMS and compare iphone plans to find the best cell phone deal.